Life with Lucy, David and Vivian: I'm a Believer!!! We met with our Pediatrician for a well baby visit and discussed with him if Lucy was ready to sleep through the night. He said once a baby weighs at least 12 pounds and is 6 months or older (Lucy is 6 1/2 months old) they are physically and neurologically ready to sleep for 10-12 hours a night. He said to pick a bed time, establish a routine (read books, sing songs, prayers, etc. ), put her to bed (let her cry it out) and get her in the morning. He said most babies figure it out in a night or two. We did just what he said and she cried for 40 minutes when we laid her down at 9pm, then slept until 2:10am -cried until 3:30am (not one of the more enjoyable moments of my life), slept until 5am (cried until 6am) slept until 7am and then happily woke up and we went in and got her (it had been 10 hours). The REAL MAGIC happened nights 2 and 3: we followed the same routine, put her to bed she cried for about 30 minutes and then went to sleep AND slept until 7:30 am without a peep!!! The Doc said it should only take a night or two and he was right. WOW!!! I think I owe our Doctor some chocolate (and whatever else he wants). Hooray for good nights of sleep! Wow, you are one lucky mama to have had that work so quickly! Most people say it takes about 2 weeks once you start before baby can get the hang of sleeping that long, so 2 nights is incredible! 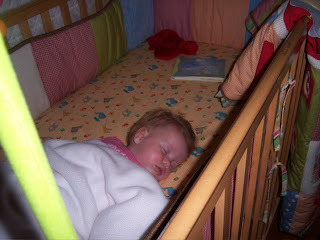 I remember with Sophie that she refused to sleep on her own (thus she shared our bed--not our favorite thing!) for the first 5 months of life. But then she found her thumb and I was able to get her to not only sleep in her own crib, but 12 hours straight as well! But I agree that up until about that age, babies aren't neurologically ready to "scream it out" and I hate it when parents try to make them do it too young. Sophie would just escalate more and more, not calm down like they say they should, so you were smart to wait until now to let her scream. I hope she keeps up this 10 hours straight for you! Way to go! YAY! Did you get my (exceedingly long) email about sleep awhile back? What you did is essentially what we did with our baby and it has worked wonders for us, too. Hooray for getting sleep!!! Good for you and yay for sleep!